Investing in a G-grade Lending Club note is projected to earn 313 basis points less than what was projected six months ago. The company published new projected investor returns in their 8-K filed on Friday that showed an expected return of 9.06% on G-grade notes. That’s down from the 12.19% figure they published in an April filing. F-grade note projections decreased by 155 basis points. For Es, it’s down 28 basis points. “Rate increases are concentrated in Grades F and G with marginal changes in other grades,” the company announced on Friday while reporting a weighted average 26 basis point interest rate increase. But will rate increases save the Fs and Gs from plummeting returns? 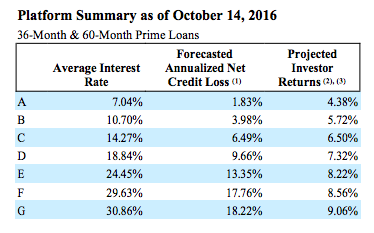 As G is the most risky grade, that means the most risky borrowers on Lending Club are projected to earn investors only 9.06%. Is all that risk worth it? Or perhaps more importantly, is that projection even realistic? Six months ago, the riskiest class was projected to earn 12.19%. Nothing has really changed from a macroeconomic standpoint since then, so it’s difficult to even pinpoint why investors should expect a 25% lower return on the riskiest borrowers all of the sudden or why they should be confident that it won’t get worse. 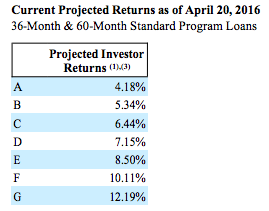 On the plus side, projected returns on As through Ds are up.